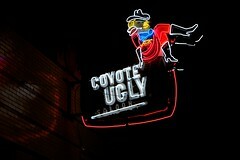 The premise was to provide a comparison with Coyote Ugly, although similarities are few and far between. There's a bar that required my partner convincing the owner to hire her and yesterday female relatives assisted which entertained the punters. That's probably as far as it stretches, overall this weekend has opened my eyes to what's expected from bar work! It's not all about dancing on the bar, spraying people with the soda gun and pouring ice over your body because there's much more required. Since Friday, I have encountered two instances of mistaken identity, one involving porcelain and the other had similarities with a tree surgeon. Being asked by one punter how I felt about his friends attempting to make advances on her was my favourite. Although being told about how our area has evolved down to the minute details was a close second! I feel dejected that I haven't been able to better provide whilst being unemployed. I just hope that I get to hear her sing at least one LeAnn Rimes number before she hands in her notice! !